Very few anglers have an angling resume that can compare to that of Pamela Basco. 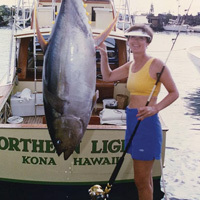 Besides setting 14 light-tackle IGFA records, Basco was one of the first female anglers to accomplish the coveted Billfish Royal Slam. Basco has also set numerous International Women's Fishing Association and Club records. In addition to her angling achievements, Basco is a strong conservationist who served as Trustee of the IGFA, President of the IWFA, and supported the Coastal Conservation Association and the Billfish Foundation.